I am posting this as a mother to an 8.5 year old daughter. My daughter is Caucasian and a Redhead. She has what I believe to be 3a and 3b curls. She has medium porosity, very thin and fine hair. I had been treating her hair like it was straight until April 2018. Her hair kept tangling constantly was frizzy and wavy. We already use sulphate free paraben free cone free hair products because I try and use the cleanest ingredients possible in my children's personall care products and food. I began with using jessicurl hair cleanser, not the cream one the other shampoo. We like it. We followed with Shea moisture for kids as a condish, use as I am leave in, Shea moisture kids curling cream, and eco style olive oil gel. 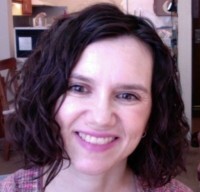 After several months, her curls developed more definition until around late August. Her curls wouldn't spring back. 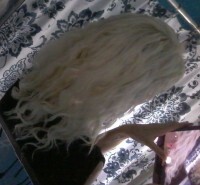 When her hair is wet it reaches her bum, and the curls got really droopy. I asked a few people what they though it might be, they said she needed something lighter. So first I tried a protein deepconditioner treatment. That helped a lot. I started getting more of Jessicurl products and her curls look good on wash day but we no longer can make it the 7 days before wash day again. She sleeps pineappled with a silk bonnet and a silk pillow case in case her bonnet falls off. I am happy with the jessicurl shampoo and the tooshea conditioner. But styling products is what I need help with for her. She doesn't have that baby hair. We need help getting her scalp to to show so much. I clip her roots and we diffuse with cool air with just tiny burst of low heat. Starting at 25% air dry, diffuse to 75% and air dry the rest. I can fluff up her roots some but would like to increase some volume and not have so much scalp showing through. And styling products. We live in North Carolina so humidity is crazy most of the year, not so much now it's 50% humidity. We have to be careful of glycerin during the summer or frizz. So to recap, we need suggestions on styling products and routines and hair cut ideas. She wants to keep her hair as long as possible but does get occasional 1/2" trims off the ends. Her hair is all one length. I haven't found a stylist that is educated in cutting curly hair. I did check 2 local ethnic hair care places but I was told her hair was too soft for them to work on her. 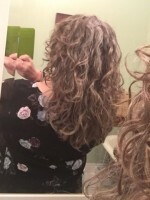 No one else in my family has curly hair except my husband's mother, but she is in heaven. I know she needs some kinda cut to make her look thicker like a graduated cut but from my understanding that doesn't work with such long hair. Maybe if a stylist told her it was best she'd do it but not coming from me. Thank you for reading all this and I'd love all the knowledge and advice you have for me. Thank you from an overwhelmed mother! First of all, do you ever clarify with a sulfate shampoo? All products, even natural ones, can build up on the hair, and sulfate-free shampoos are generally not strong enough to get all the buildup off. Most of us on the forum use a simple sulfate shampoo every now and then to get rid of buildup. That might be part of the reason your daughter's curls seem droopy. I have very fine hair too, and for volume, I use the Intelligent Nutrients Volumizing Spray or the Living Proof root lift product. For gel, I switch among a handful: Intelligent Nutrients Styling Gel, Alaffia Wavy to Curly Gel, Carina Organics Gel, Kenra Firm Hold Gel, and Kenra Ultra Freeze Gel. I find that a good hard-hold gel is the best way to get volume. You might have to use quite a bit. Once the gel cast has set and the hair has dried, you can scrunch out the crunchy parts, but there will still be lots of hold and volume. The Intelligent Nutrients products are expensive, but I think they're really good. I also really like the hairspray. I unfortunately don't have any advice about the haircut other than to try to research a good curly hair stylist in the area. I'm not sure where in NC you are, but Scott Musgrave is in Cary, and he is supposedly amazing. You might want to try using a bit of mousse at the roots to make it look thicker. I like AG Natural Cloud Foam, and there's Deva Curl Volumizing foam or Innersense I Create Lift. If you want something cheaper, Herbal Essences has one that's silicone free. Honestly, maybe just relax on the styling? Leave a bit of conditioner in and comb through it, let it air dry. She’s a kid so frizz is ok. The frizz will create more volume and not let her scalp show as much. as far as hair cuts, if you can’t find a curly stylist, she probably wants long layers to take some of the bulk out. Just do not let anyone use thinning shears.